Yep, I'm guilty, I love showing off my equipment - don't we all? Here is a picture of the putes that I had set up in my office over the summer of 2001... You can click on it to get a better look. 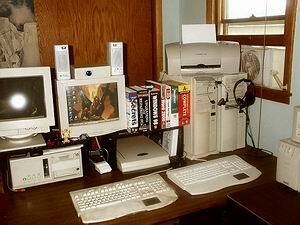 Here we have a shot of my system setup over the summer of 2002. A couple of additions and changes, most notable non-tech, are my bears. The ones that were stolen have still not been returned but the others are back in there accustomed locations and are quite happy to be back on display. Didn't get a chance to get a pic in 2004.. but not that much had changed either. But 2005 is here and I have a few new additions... Now... if I can't scrounge a decent camera I'll use mine. But it won't be a really sharp one... Now.... where is that camera? Here is a before and after shot of the other desk in my office. I wanted to show what you can do with a bit of imagination. Using scraps of stuff that I had laying around, some empty jewel cases and some black electrical tape I came up with a CD storage rack that took up a lot less space than the unit that I had purchased and holds more than twice the disks! If you think about it, could you do the same? Better organization means less work when it comes to hunting down CDs - not to mention having more room to work when you're tearing a system apart or laying out parts for a new build. The PDA that I carry in my pocket today can do more than those machines ever could! In '94 I switched over the IBM compatibles when my father and I started a BBS called Deal$ and Dollar$. We were running Wild Cat! 4.0. Had no idea when we first started that project that I'd end up where I am today. I've built 43 machines since then... and fixed and upgraded dozens and dozens of others. I've even had quite a few laptops that I've had the 'fun' of fixing. I love picking computers apart and making them run again. Not too much scares me anymore, though, I'll tackle just about anything. Most of my time is now spent as a thyroid patient advocate. Working on several support groups that I co-own with a friend in Texas and a website that we'll be adding to as time goes one. If you want to learn more about thyroid for yourself or family member, swing by sometime, you're more than welcome! Just started a new group for laptops in June of 2005... modding inside and out, gabbin about what we can do with, and to, our machines. You're welcome to swing by if you're into modding and/or laptops! I've set up a tips section to add on the site, for those silly little tricks and shortcuts that you occasionally run across that have you going 'oh my god! I can do that??" Some of them are really fun. I'll be adding them a few at a time, the link is up on the left. The newest ones will be added at the top, just like my recipes are, so that you don't have to scroll the entire list to see if there is anything new.